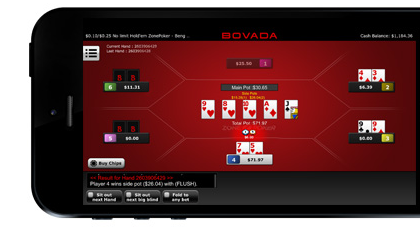 Bovada Mobile Poker Client Featuring Zone Poker - iPhone + Bodog / Bovada! Bovada are already way ahead of the other US offshore poker sites. Their average of 1350 concurrent cash game players puts the 425 and 260 of rivals Merge and WPN in the shade… and there are many times this number of players enjoying tournament action too. Now you can enjoy ‘Zone Poker’ on your iPhone or Android Smartphone with a brand new app. Zone is Bovada’s ‘Fast Fold’ poker game. Instead of being seated at a normal table, you join a pool of players at whichever buy-in level you choose. Each time you fold, you get taken to a brand new hand right away – combined with other players from your pool. You can even fold out of turn. What this does is take out all the time you would normally spend waiting for others to play out the hand – which makes for a fast and entertaining game. This is ideal for smartphones, you can jump in, play a bunch of hands quickly and then jump back out whenever you wish. At the moment you can only play 1 table at a time, and you’ll access this game through your browser rather than via a downloadable app. It will work with an iPhone 4s+ or equivalent Android phone or tablet. This new app runs alongside the ‘instant play’ browser game which does work on larger Android tablets. This is just the start from the biggest US friendly poker site – they have promised cash games and tournaments will be added soon. The only real rival to this for US players is the rather simple cash game browser app from Carbon Poker. For me, this game is enough to keep Bovada in the lead in the US rankings for some time to come. Check it out for yourself at www.bovada.lv now! Here are few reasons to check out this site for those readers who are not yet familiar with them. FYI Bovada are only for US players, there is a separate Canadian site (Bodog.eu) and an Asian-facing site with a separate suite of games too. Trusted Brand: While the Bovada brand is new to many people, this site will be familiar to anyone who ever played at Bodog. The brand separated sites and renamed after ‘Black Friday’ and is the same old back-end. Unique Promotions: Vacation packages (including events with the infamous Bodog parties) and lots of one-off and unique promotions makes this site stand out from the crowd. Check out their website for the latest offers. Easy payments (credit and pre-paid cards) and fast withdrawals come as standard at Bovada. They are a top High Tech Gambling rec, and with this latest mobile game offering look to be leading the way for the offshore sites.